Help with extending the length of my barrel! I recently purchased my first airsoft gun after renting a few times. I did lots of research and finally bought the g&g CM16 SR-S. It has a 205mm inner barrel and i wanted to know how i should go about extending that. I know that once it is extended, i will need a mock suppressor to cover it up. Barrel length won't do much to your performance. It might tighten up your accuracy a little, but it's probably really marginal. What are you trying to get out of your gun? More range? More accuracy? There goes me with all my research and buys the 'S (short)' version of the gun! Barrel length will not increase range. Installing a barrel with a tighter bore (6.03mm for AEGs is fine) may tighten up your accuracy and increase your muzzle velocity a little. Look at it this way- it's better to have a short gun that can work well in both woodland and CQB, than to have a long one which you can't easily do any CQB with. Oh yeah and I wouldn't advise listening to people at sites when they advise you on tech unless they are an actual hire gun technician/on site shop technician. It's like listening to the man down the pub when he advises you on your mortgage, he won't know anything and will put false info into your head. So i should just install a tight bore 205mm barrel and im good to go? if so, thanks for your help! You want a quality barrel and hop rubber. And the Hop rubber is BY FAR the most important component. +1 to not listening to what airsofters on site have to say about performance characteristics of certain stuff. Same, really, be careful online too. I've always had favour to the Madbull Blue, but they can be tricky to fit. recently been enjoying the (cheaper) guarder clear, but they are quite easy to tear (for a rubber, they don't just fall apart). Some people like some stuff that others wouldn't touch with a barge pole. Try a Guarder Clear first as they are a good rubber for most stuff and if you don't like it, it's not much money really. I've just had a quick look, and I can't seem to find any 205mm tight bore barrels... Any suggestions? The best thing i've found is to get a general consensus when looking for advice, unless you know the person you are talking to is knowledgeable enough to take their word at face value. Dave is one of the people on here i'd listen to, but it's best to make up your own mind. Lubricating gas blowback pistols is a good example I came across. Not long after I had got into Airsoft I asked 3 different shops what to do and got 3 completely different answers. Madbull barrel wont give you any real benefit over the G&G one thats inside. To get any real difference you would need to go for a Pdi 6.08 or an Orga widebore. Both are expensive and the orga requires you to do a lot of work to recover fps loss. To be honest I wouldn't bother. Hop bucking is the main thing as Pointed out above and also which bbs you use. Firefly and flat nub= best standard set up in my opinion but fiddly to set up and takes at least a 1000 rnds to wear in. Will also wear out a bit quicker and costs about £25. Bbs blaster 0.25g cheap, easily available and pretty good quality. Blaster devils 0.28g again cheapish and easily available with good quality. Is it definetly a 205mm you need? 229 is the shortest easily accessible one. Try a 229, if it's a bit long cover the extra length, DO NOT CUT A BARREL DOWN, you won't crown it properly without a lathe and then you've negated the use of the upgrades completely. Spray here, here, here, loads in here, give a bit in there and it should be ok.
Cloth/towell/paper to clean as much crap off slide rails as reasonably possible, should be grey coloured fine oil stuff coming off. Small (2mm diameter) DROP (not spray) of oil onto the rails at the front and push it backwards with your finger. Don't bother with the trigger mech, they're greased fine from the factory. Any more than that or without cleaning the rails every time you re-lube and you're just making a grinding paste, accelerating wear on your pistol. I don't suggest doing anything more than that on most pistols as they aren't real, and are going to break within 3-4 years MAX. maintenance is to extend the longevity of the product, but the product does not have THAT long a life anyway, so why bother. Another tip, if someone asks to do something, ask why. If they know what they're talking about, they can tell you why to do something. Thanks guys I will get on to ordering a new hop up bucking straight away! Thanks for the help, I really appreciate it. Hopefully I will be able to aid my friends and others someday too. This 100 times. A lot of the time the response will be 'it's what the last guy told me I should do'. "Its what the tech guy who fixes my gun said"
Always a bit aprehensive of listening to people who dont get their hands dirty themselves. If one is reading this and has a lathe*, but still has no clue what you're talking about, should shortening a barrel still be avoided? If one is reading this and has a lathe*, but still has no clue what you're talking about, should it be avoided? I'm assuming you're referring to adding the indentation which makes the transition from the inner bore to the outer diameter less abrupt. I have knowledge and experience using the Lathe in my (parents) garage. Do I actually bother to cut barrels down? No. Just buy one the right size and save the trouble. If it was easy, Madbull/PDI/Whoever would make 1 barrel length of 650mm and let you hacksaw it off at home yourself. Yes, "what is crowning" has me stumped. Though in all seriousness i've been looking for a wide bore 140mm (or shorter) barrel for half an hour now, and I can't even find one. Finding a 1 inch barrel extension raised me up a little though. Crowing is basically finishing the end of the barrel. On airsoft barrels this is generally a tapered edge that can start as far as 15mm before the end of the barrel. It won't mess with the airflow that way and screw up your hop. The crown is there to stop the actual barrel from getting damaged - on a flat edge this would be easy, but as the contact edge is recessed into the barrel by a few millimetres it's not going to get beaten up. 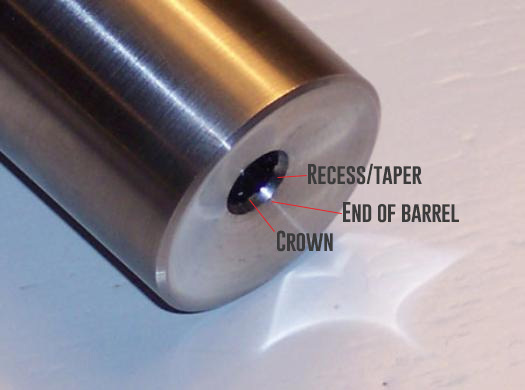 Specifically the crown is actually where the inner barrel (where it's contacting the BB) ends and the tapering starts. Also, a lot of people that cut their barrels do it horribly with something like a hacksaw and leave burrs and rough edges that are going to mess with that airflow as well. Thanks, that's just the affirmation I needed. I wasn't sure if it was the tapering from the inner bore, or the tapering from the outer diameter, or the domed bit where both effects meet or everything . Yeh. Technically it's where the bit that contacts the BB ends (just like a real barrel and bullet), but realistically people just refer to the whole tapered edge as 'the crown'. Probably not the best example as this barrel is basically crowned twice (the whole front being recessed slightly), but hey you get the idea. The firearms definition is very clear that the crown is where the bore ends though. Crowning on an airsoft gun is where the end of the barrel is turned perfectly square to the inner bore. It is then tapered inwards towards the inner bore, either with a straight chamfer or a radius. Then its polished to remove any burrs. Its done so when the projectile and gases leave the end of the barrel it does so symmetrically because its square and the taper allows the gases to disperse in an even cone shape behind the projectile. Any deviation of pressure on the projectile can cause accuracy issues. This is mainly for real guns using a rifled barrel but can have a beneficial affect to a lesser degree on an airsoft gun. People who cut barrels with a hacksaw will never get them totally square so the projectile and gases will always leave one side of the barrel first and the bb will generally curve more. Rock-climby-Dave is right though you might as well just buy a new one the right length. I would charge more to do it than a PDI barrel costs because its a crap job to do.